Another variant of the classic interconnect but has it got any better? Sensibly priced, this cable offers a performance which is a step up from budget types. Compatibility is excellent and satisfaction for all but bass freaks. It's little short of astonishing how many variants on the classic 'QED79' theme the QED company has come up with – but then there's no evidence that there was ever anything fundamentally wrong with the figure-8 cable construction. 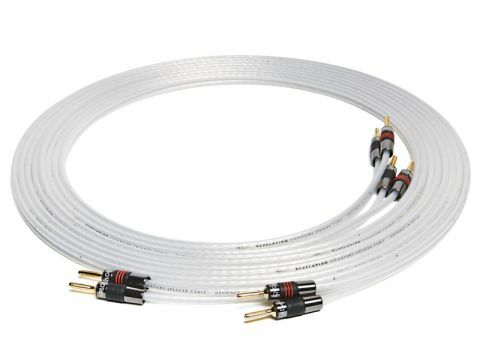 The Revelation integrates developments from QED's 'Genesis' cables and also from the 'X-Tube' models and though the firm is not specific exactly which features are taken from which range, it's clear that this cable uses counter-spiral wound arrangements of conductors in the two cores. In fact, there are ten conductors, each made up of multiple smaller strands wound together, spiralled round a central non-conducting core in X-Tube style. Conductor material is silver-plated copper and insulation is hard, transparent polythene which gives the cable very low dielectric loss: resistance is average. We had quite a consistent result with this cable across a range of amps and speakers. Its sound seems to combine good performance in all areas, without necessarily standing out in any of them. Bass and treble are both well extended, though the former lacks some of the extreme depths we've heard from some cables in the past and the latter is not quite as airy and detailed as the very best. Midrange is very natural and voices are well served, with plenty of characteristic resonance and clear consonants. Rhythm and timing are good, too and the sense of 'snap' that we heard from systems connected with Revelation is, perhaps, its strongest suit. In typical QED style, this is very much an all-rounder.